Changelly is celebrating the company’s 4th anniversary. During these four years, the company has evolved from a small startup consisting of 5 people into the leading product in the cryptocurrency market and has earned the trust of millions of users worldwide. Changelly rocket was launched in 2015, with a team of 5 fearless crypto astronauts on board. At the beginning of the space path, there were only 30 crypto assets listed in the service. Within the first year, thanks to the support of 100,000+ Changelly users, we confidently moved towards the moon. Indeed, the path to a pedestal of the best instant crypto exchange service was not easy. 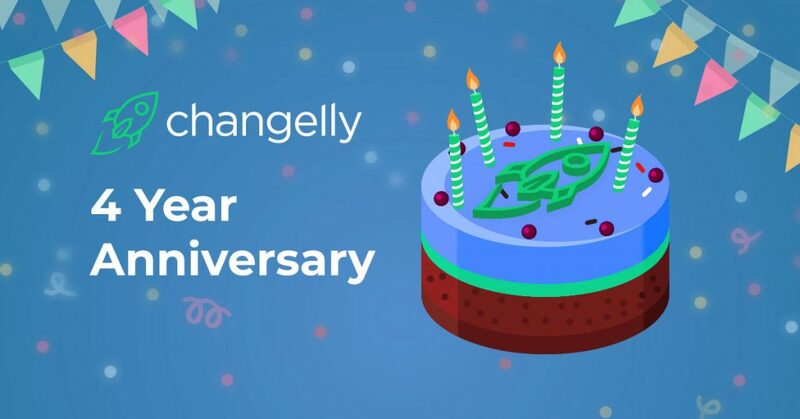 On this fantastic spring day let’s go over the significant milestones of Changelly 4-year history. To please our beloved users, Changelly launched a quiz with nice prizes in honor of our 4th birthday. To win 1 of 5 cool Changelly merch packs, you need to solve seven rebuses and create Changelly account (in case you haven’t got an account yet). Read more about the quiz conditions and the rules of participation by clicking the button below! Best Swaps from Changelly space team!